Thank you for the constant encouragement, Brenda! I am so glad you are keeping yourself and your kids sun safe! Well spoken, Martha, well spoken. Until I met you, I went to a tanning salon every spring “to get a little color”. I not only do not go anymore I share with others how bad it is. I have learned so much from your journey and am proud of my white legs now! Love you sweet girl!! Thank you Kelly! I am so thankful you keep your skin and those girls safe now! Love you! Thank you for your faithful prayers! I definitely need to be more diligent with sunscreen. This was a good reminder of that. Thanks Shelly! It can be a tough habit to establish, but it’s an important one! I’ve learned the hard way! Thank you for sharing your story – the lived experience is such a powerful teaching tool! Great reminder!! Thank you. It isn’t the story I would have chosen, but I’ve promised God I would share the story I’ve been given! Thank you! My blog reading habits died with Google Reader as well. I miss it so, can’t seem to get in the habit of using the new RSS readers. Sorry you have been touched by melanoma. Until then, I’m so thankful for the melanoma community. Your story and others like it have gotten my attention more than once. 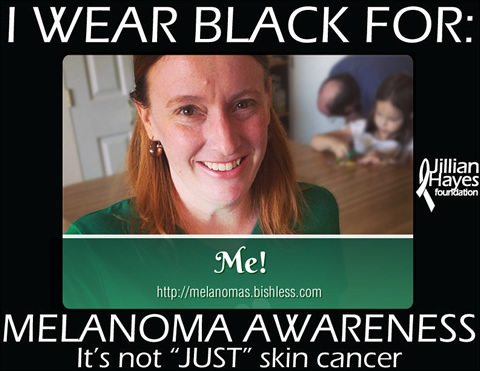 It’s not “just” skin cancer! I will confess I sometimes wince at my reflective legs, but I am trying really hard to change my perspective for my daughter. I would have her bottle or spray tan in a heartbeat rather than UV tan, though! Fake and bake is a great alternative! Thanks for your honesty AND sweet comment!